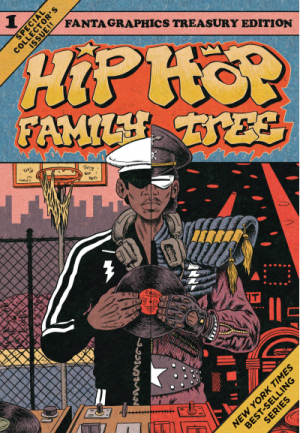 Originally serialised a page a week on web site boingboing, Fantagraphics are collecting Ed Piskor’s history of hip hop in a series of deluxe volumes. 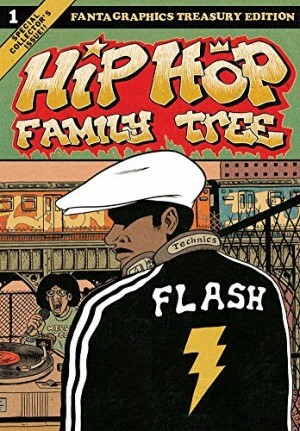 Starting in the New York City’s poor South Bronx, in the 1970s, Piskor identifies hip hop as growing out of the gangs. He paints a picture of community and collectivism, as people bringing different skills, not just as DJs and performers, but as bouncers, managers, and salespeople, with others improvising, like DJ Tony Tone building speakers into oil drums. This is no romanticised utopia though: we see the death of one of the early prime movers as the casual waste of life it is. The sheer volume of different characters is a challenge, but this is a true story not of a handful of auteurs, but of a mass, democratic movement. Given the large cast Piskor manages an impressive job of creating distinct and only mildly caricatured portraits. The ‘Funky Index’ and hundred portraits on the end-papers emphasise the numbers involved. We have cameo appearances from people who’ll have key roles in later volumes, such as privileged white-boy and future label boss and record producer Rick Rubin appearing as an Archie Comics pastiche Rickie Rich. 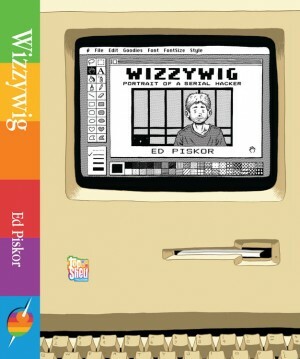 Piskor had already produced the innovative 400 page Wizzywig about computer nerds and hackers. 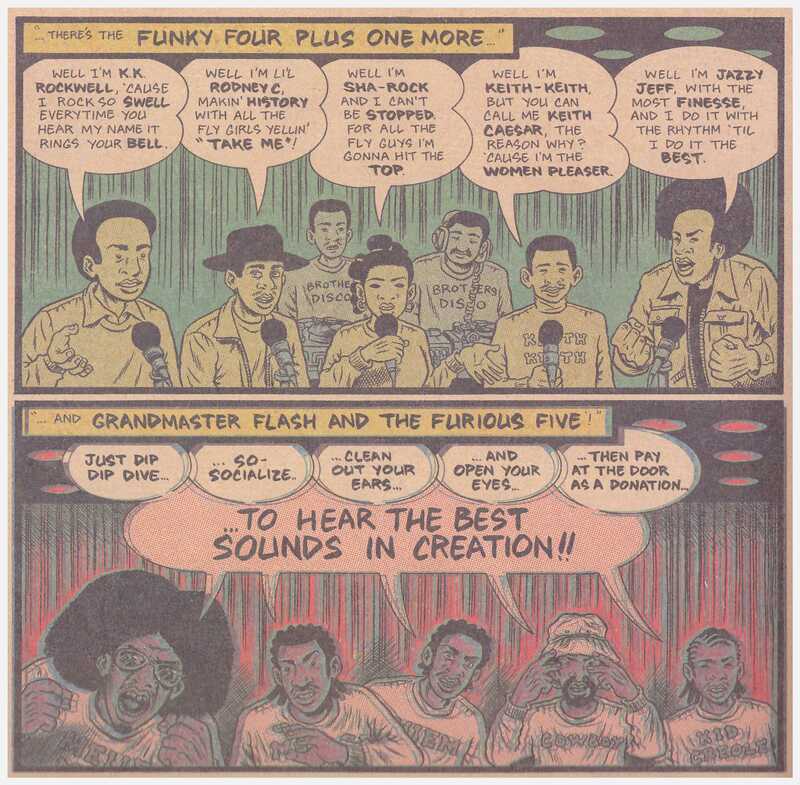 Here he makes deft use of distinctive devices, such as overlapping word balloons to capture the edit effect of sampled vocals, text boxes with arrows to characters, and printing the four ink colours out of register for a shaking, out of focus effect to capture the volume and bass of the early sound-systems. It’s drawn like a 1970s comic: inked in clean brush lines with minimal hatching, and printed like a Marvel Treasury oversized collection – including pin-ups, and faking the discoloured newsprint and cheap printing. 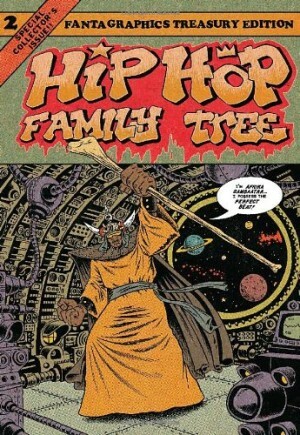 A bonus three-pager delivers a compelling case for ‘The Comic Book/Hip Hop Connection’: urban settings, aliases, costumes, battles and team-ups. 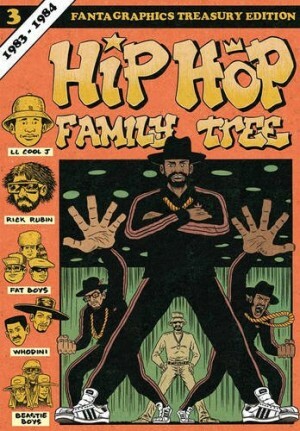 Clearly, Piskor’s a hip hop devotee, this is a labour of love, and as he didn’t live through any of this volume, it’s well researched. He tells and shows people’s perspectives, but maintains the objective tone of an historian. The origins as single pages on a web site have also given him admirable concision. A good example is where he quotes groups of MCs introducing themselves in their raps. It’s a positive (but still cool!) story, fuelled primarily by love of music and community, even to a large extent by the managers and entrepreneurs. We’ll see how that pans out in future volumes. By 1981 hip-hop was receiving mainstream attention, including on TV show 20/20: “you can’t get more mainstream or white than [that]!”. That’s a good place to end volume 1. Hip hop fans will delight in this, but it should also appeal to anyone with an interest in the development of music, popular culture in general, or just good graphic novels. 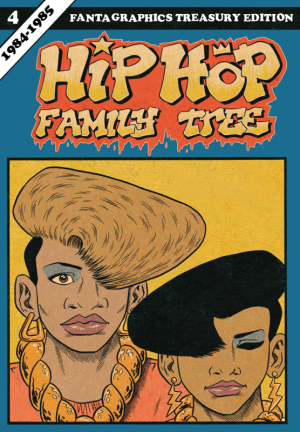 This is now also available slipcased with volume 2 as Hip-Hop Family Tree 1975-1983, also including a comic exploring the shared influence of hip hop with comics.